The life prediction of structures is a strategic research area that involves multidisciplinary approaches covering multiple size scales - from the nanometer to the meter- and thus involves a great range of physical phenomena. For instance, the lifetime of a gas turbine disk or of the blade of an aircraft engine is dependent not only on the geometry and the applied structural loads, but also on the physical phenomena that control the local constitutive material behavior. This strong coupling is responsible for the evolution of the initial material microstructure and, as a result, influences the overall structural behavior. 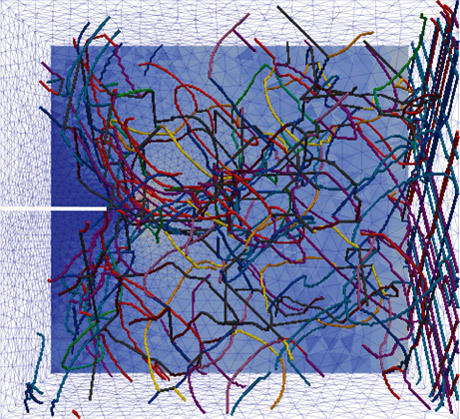 This issue of the Aerospace Lab Journal deals with research activities around the microstructure - constitutive behavior - structural lifetime links. It contains contributions on (i) dislocation dynamics and crystal plasticity to describe the evolution of plastic deformation at the lower scales (e.g., that of grains), (ii) the explicit modeling of microstructures such as polycrystalline aggregates, to study the material evolution under complex loading conditions (time, stress, environment and temperature), (iii) the prediction of the macroscopic constitutive material behavior based on the previous local approaches, (iv) the study of crack initiation and crack propagation phenomena under multiaxial loads and, finally, (v) the modeling of the behavior of actual structures subjected to dynamic loads.